In his highly anticipated book, ‘A Higher Loyalty‘, fired FBI Director James Comey writes that former President Barack Obama ‘jeopardized the Hillary Clinton email investigation. Comey extends similar criticism to ex-Attorney General Loretta Lynch. As The Gateway Pundit previously reported Comey admitted that Lynch attempted to suppress and reframe the investigation into former presidential candidate Hillary Clinton’s illegal private email server. Lynch purportedly directed Comey to immediately stop referring to the Hillary probe as an “investigation” or a “probe” and, instead, refer to it as a much more gentle “matter”. Comey had a second meeting with Lynch where he confronted her about her election interference. According to the report, when confronted, Lynch stared at Comey with a ‘steely silence that lasted for some time’ before she asked him to leave her office. Documents released in August of last year show Comey exonerated Hillary Clinton before the investigation into her email conduct had concluded. Even more concerning is “Mr. Comey even circulated an early draft statement to select members of senior FBI leadership,” reported Townhall. 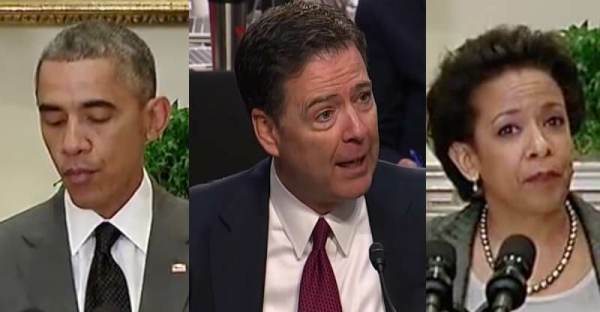 The post Comey Book Takes Aim At Obama And Lynch For Jeopardizing Clinton Email Probe appeared first on The Gateway Pundit.